We are the champions! TFHS prevails in a pitchers’ duel and brings home the state championship — full coverage in this week’s issue. 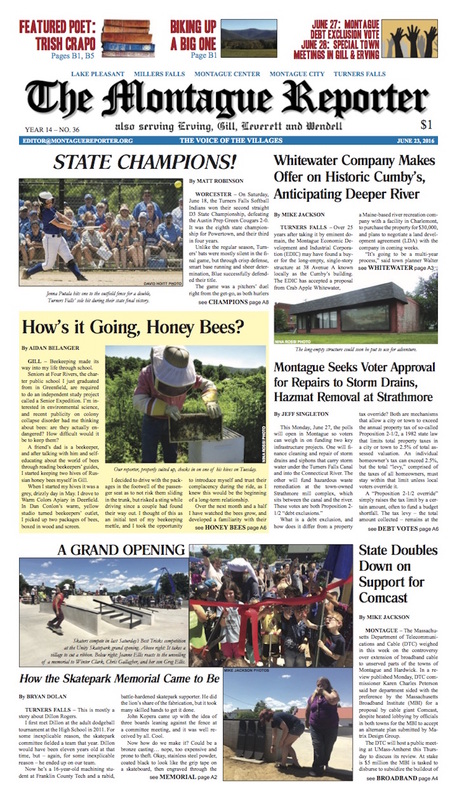 Whitewater company makes offer on old Cumby’s building; Montague seeks Proposition 2 ½ override to fund storm drain repairs and hazmat removal; and state doubles down on support for Comcast. We’ve got skatepark grand opening photos and coverage, along with the story of how an FCTS machining student, with generous community support, created a memorial to three skatepark supporters. Another industrious student relates his experiences keeping beehives in Gill. The GMRSD signs on to the idea of a police officer at the high school, acknowledges resignations, honors retirees, and discusses preschool tuition. And, notes from the Erving and Wendell selectboards. 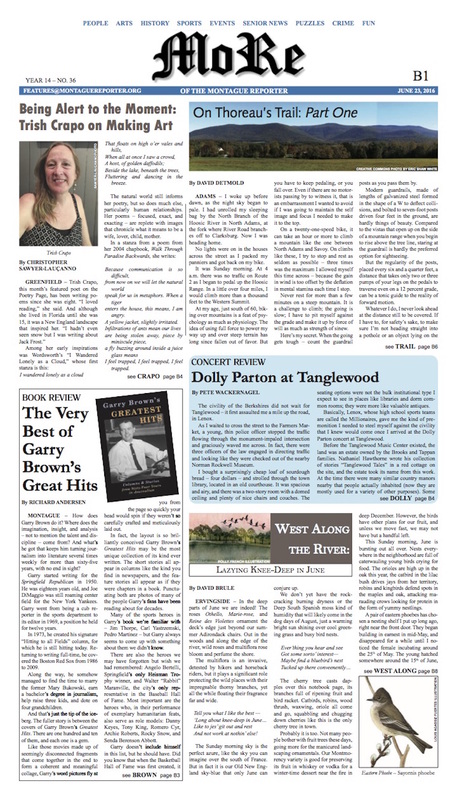 MoRe: A profile of this month’s featured poet, Trish Crapo; David Detmold is on Thoreau’s trail; our critic encounters aggressive civility and elaborate picnics while taking in Dolly Parton at Tanglewood; West Along the River lazes knee-deep in June; and a new compilation of sports columnist Garry Brown’s greatest hits. Plus: mail art at GCC; Part VII of Turners Falls Goes to War; the Healthy Geezer’s on fire this week; and a perm gone bad kicks off this week’s Montague Police Log.